The long history of travel in Egypt is far from monolithic. As motives for travel, individual preferences, cultural backgrounds, and the cultural and political scenes in the country change, so the points of interest and perceptions in the resultant writing change. In this book, travelers from different countries, different times, and different cultural backgrounds are brought together through an experience they all shared the experience of having journeyed in Egypt and written their impressions of the land, the people, the culture, and the history. The encounters tell as much of the place visited as of the travelers’ personal inclinations, interests, and time. These varied voices give a comprehensive account of the history and geography of Egypt, its archaeology, and social life as perceived by non- Egyptians. The written map of Egypt presented by this book is also a historic ‘road map,’ charted over the centuries by both foreign travelers and Egyptians. Over the centuries, new roads were constructed and trodden and old ones abandoned in a way that largely reflects the interests of the travelers and their motives for travel. Alterations in roads and itineraries often came about because of changes in means of transport and en route stops: some cities disappeared, while others, meeting the ever-changing needs of the local population and travelers, were established. The construction of the Mahmudiya Canal in the nineteenth century not only allowed the irrigation of new land and easier transport of people and goods but also created a different route between Alexandria and Cairo. It allowed travelers to sail across the Delta and report about the new towns and villages that were developing on the banks of the canal. The once ‘beaten track’ from the Nile Valley across the Eastern Desert to the Red Sea ports of Aizab and Qolzum, which launched Muslim pilgrims toward Mecca and other destinations, was abandoned as means of transport altered over time. What remains of this route and of those transit cities are only the travelers’ narratives of them. The construction of the Suez Canal also created a new itinerary for those who formerly took the overland route to India. New stations and destinations brought places into being in a way that made both travelers and residents charters of the country. This history of adaptation and continuity is what informs this book. By bringing together a patchwork of travelers’ voices and testimonies that tell of the palimpsest that is Egypt, this book reflects today’s Egypt just as it probes into its history. It reveals not only what is present but also how it came into being and how it was perceived and encountered. It speaks of both what has been and what is. 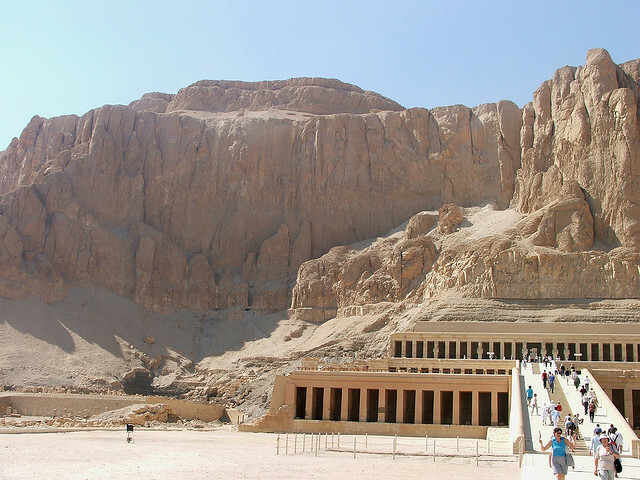 Egypt has had a generous share of travelers. In 450 B.C. Herodotus wrote about the country, giving a traveler’s account that narrates not only what was there but also what he considered worth looking at and recording. A few centuries later, Strabo followed in his footsteps. By the turn of the tenth century A.D, Arab geographers such as Ebn Haukal and Al-Muqaddasi were traveling the country recording their own observations. In medieval times, a concert of Muslim travelers, mainly pilgrims heading for Mecca, stopped in Egypt. In the eleventh and twelfth centuries, the Persian Naser-e Khosraw and the Valencian Ibn Jubayr, two pilgrims who arrived in Egypt from the east and the west respectively, kept journals in which they recorded their impressions of the prosperous Fatimid state. Scientists such as ‘Abd al-Latif al-Baghdadi visited Egypt in pursuit of learning in the thirteenth century, while in the fourteenth century, Ibn Battuta, one of the world’s best-known medieval travelers, was driven largely by curiosity. At the same time, western merchants and pilgrims heading for Jerusalem, such as Friar Felix of Germany, stopped in Egypt and recorded their impressions. The eighteenth century brought explorers and merchants such as the Dane Frederick Norden and the Englishman W.G. Browne, and officials serving in the East India Company, such as James Capper or their wives, like Eliza Fay, all of whom left vivid accounts of their experiences in Egypt. Yet it was Napoleon’s Expedition (1798) that brought French scholars, such as Vivant Denon, to study Egypt and lead Egypt to the full attention of Europe. It also caused a shift of interest from the biblical and historical associations of the country to its pharaonic monuments. Nevertheless, the attention of the scholars who visited and resided in Egypt in the nineteenth century was by no means confined to archaeology. Along with Egyptologists like J.G. Wilkinson of Britain and Richard Lepsius of Germany, visitors like Edward W. Lane were interested in modem Egyptians and their way of life. Adventurers and explorers like Frederick Henniker and Richard Burton continued to travel throughout the country. The rise of Muhammad ‘Ali to power and his projects for the modernization of Egypt were other factors attracting European travelers. Giovanni Belzoni was one of the important antiquities collectors in Egypt in the early 1800s. Although his wife Sarah traveled with him and wrote an account of her trip, it was not until the 1840s, with the introduction of steam navigation and the construction of the overland route, that female travelers truly started to flock to Egypt Harriet Martineau was one such tourist. The year 1869 witnessed the opening of the Suez Canal and the beginning of Thomas Cook’s organized tours, making travel in Egypt more a pleasure than an adventure. Travel in Egypt continued to flourish in the twentieth century, attracting more scholars and tourists from all over the world. In recent years the Indian writer Amitav Ghosh wrote of his experience in Egypt and what the encounter meant to him. Moving between the country’s history and its present, he reveals the continuity and change of Egyptian cultural life, while Elizabeth Femea narrates her experience as an expatriate housewife in Cairo. Published within the span of a decade, these three accounts of Egypt further reveal the different perceptions that personal interests and inclinations can produce: the different ways in which a place can be experienced. The different cultures, places, and histories that the travelers recorded continue to coexist with the modem country. One need only cross the Nile to step from the plateau of the pyramids to Coptic Cairo, and a few strides takes one from the European-style city center to Islamic Cairo. The deserts and their oases maintain their character just as they tell of the changes brought about by the diverse ways they were inhabited, traveled through, and perceived across the centuries. Readers of this anthology tour Egypt in a way that no travel agent can offer: not only do they see its present and learn of its history, but they also meet previous travelers. Time overlaps in this account, bringing different moments together and hence forming a new narrative of Egypt. In this book Herodotus rubs shoulders with Ebn Haukal, and Rudyard Kipling speaks to al-Muqaddasi, narrating their experiences and impressions. The chapters are organized according to place, the way current travelers may experience the country. Following in the footsteps of most travelers’ accounts presented in the book, readers disembark in Alexandria where Herodotus, Ibn Jubayr, and Edward Lane first set foot, then make the tour up the Nile and into the deserts. Deborah Manley and Sahar Abdel-Hakim, an Englishwoman and an Egyptian woman, were brought together through their shared interest in travelers to Egypt. They first met in 1997 with the establishment of ASTENE (the Association for the Study of Travel in Egypt and the Near East), a UK-based association of which they are both founding members. Both had worked on travel literature about Egypt prior to that, but through ASTENE their shared interest found a new form of expression. Manley, herself a traveler in Egypt and an authority on British travelers to that country, became engaged in this area through her extensive readings of travel accounts of Egypt. Abdel-Hakim started off as an academic whose interest in travel writing about Egypt stems from a desire to learn about representations of her country in various cultures. Though each came from a different direction, their shared interest in travel accounts of Egypt, of how it felt to be there and to experience Egyptian culture, and how it was that the country seems to change its face in the different narratives, brought them together in a way that probably could not have been anticipated a few decades ago. This book offers one of the shapes in which their work together took expression and reveals their diverse interests and perceptions. It is a book that brings together experiences of Egypt and its always welcome visitors.